With the presence of a large pool of participants, the global ceiling tiles market is displaying a highly competitive business landscape, finds a new research report by Zion Market Research (ZMR). SAS International, ROCKFON, Armstrong World Industries, Incorporation, Grenzebach BSH GmbH, Saint-Gobain S.A., Odenwald Faserplattenwerk GmbH, USG Corporation, and Knauf are some of the key vendors of ceiling tiles across the world. These players are focusing aggressively on innovation, as well as on including advanced technologies in their existing products. Over the coming years, they are also expected to take up partnerships and mergers and acquisitions as their key strategy for business development states the ceiling tiles market study. Citing an instance, on October 1, 2018, Cersaie—the annual worldwide exhibition of ceramic tiles and bathroom furnishings—was held in Bologna in Italy. Reportedly, the main goal of the inauguration of the exhibition was to showcase world of tiles and bathroom surfaces. As estimated in this report, the global ceiling tiles market stood at US$ 25.45 billion in 2017. 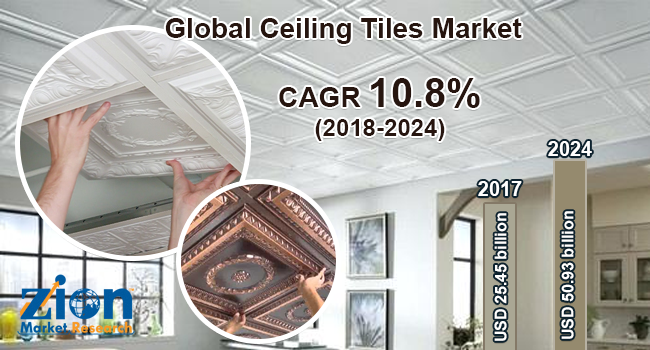 Witnessing a tremendous rise during the period from 2018 to 2024, the revenue in this ceiling tiles market is expected to reach US$ 50.93 billion by the end of the forecast period. The main product types available in this ceiling tiles market are mineral wool, gypsum, and metal. Among the three, the demand for mineral wool is relatively higher and the trend is anticipated to remain so over the next few years, notes the research report. “Massive product use in construction activities along with escalating demand for recyclable products is expected to contribute remarkably towards ceiling tiles market earnings over the years to come,” says the author of this study. Apart from this, mammoth requirement for improving building acoustics along with extensive need for bringing an improvement in the thermal insulation of the structures will further boost ceiling tiles market demand in the near future. In addition, prominent increase in the global population and urbanization is projected to help in flourishing of the constructing sector. This, in turn, will pave a way for growth of ceiling tiles market within next few years span. Rapidly changing raw material costs, however, are expected to disrupt the progression of ceiling tiles market in the upcoming years. Regionally, North America has been leading the worldwide ceiling tiles market and is anticipated to continue on the dominant position in the years to come, states the ceiling tiles market study. Rise in the number of construction activities witnessed in the countries such as the U.S. along with burgeoning demand for sustainable development in the region is the main factor behind the dominance of the North America ceiling tiles market. The huge presence of reputed construction firms in North America is another significant factor that is supporting the expansion of this regional ceiling tiles market.